Xianyang was the first Capital of China. Even by Chinese standards Xianyang (pronounced "sheng young") is an ancient city. In 2001, the 2350th anniversary of the founding of the city was celebrated! Xianyang was the Imperial Capital of the First Emperor of China, Qin Shihuang. A history of Xianyang and Emperor Qin Shihuang is provided in another page on this web site. Today Xianyang is a modern rural municipality with a population of 4.83 million. 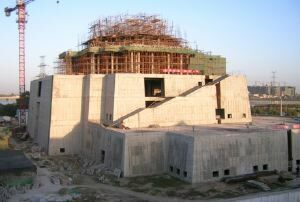 It is located 28 km to the north west of Xi'an, the Capital of Shaanxi Province. Its major city is Xianyang, but most of the municipality is fertile farming land with approximately 60% of the population living in the towns and many villages spread thoughout the municipality. Xianyang's industrial base is located principally in Xianyang City. Xianyang is home to China's largest TV tube manufacturer together with related electronic firms. 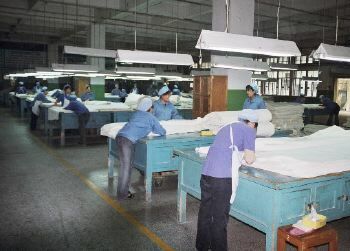 Xianyang's other major industry is textiles and garments which have an annual output of 1.8 billion Yuan (A$300 million). Xianyang's industry is also strong in traditional chinese medicines and health care products, food, petrochemical and light industry and building products. Xianyang's extensive agricultural production includes wheat, corn, vegetables, fruit (especially apples), beef cattle, dairy cows, pigs, goats and sheep. There are 38 speciality vegetable markets in Xianyang with an annual trade value of 1.2 billion Yuan (A$200 million). There are also two major vegetable markets supplying the regional and national market with an annual trade value of 700 million Yuan (A$110 million). 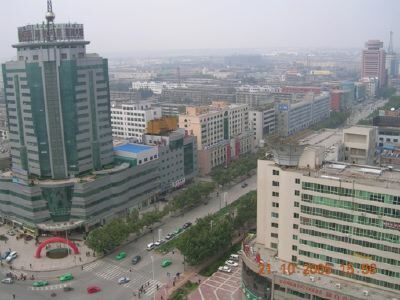 A typical view of Xianyang City (photographed during Mark Higginbotham and Simon Mann's trip to Xianyang in October, 2005). 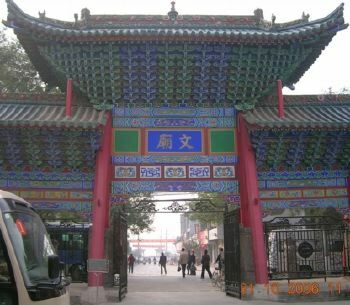 The entrance to Xianyang Museum, which originally was a Confucian temple constructed in 1371. 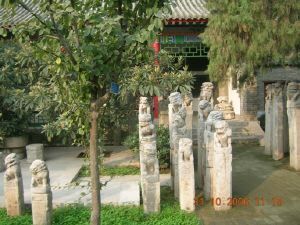 Marble columns in the grounds of the Xianyang Museum. 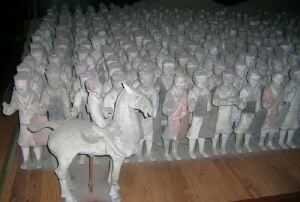 Figurines of horses and cavalry found in the tomb of a General of the first Han Emperor. The objects included officers and musicians. The delegation is welcomed outside the entrance to No. 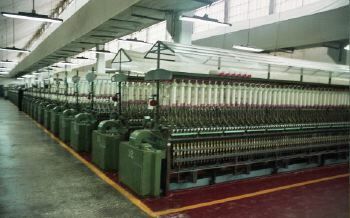 2 Cotton Mill by senior managers. 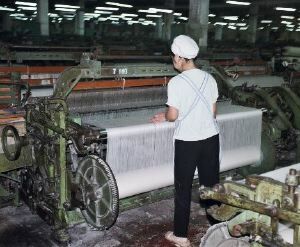 At the No 2 Cotton Mill, raw cotton is processed and spun into thread and then woven into cotton sheeting for bed clothes. 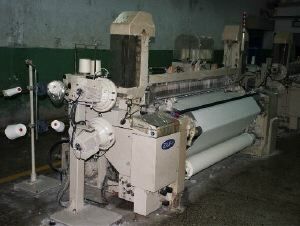 This machine converts layered raw cotton into a loose broad thread for further processing. 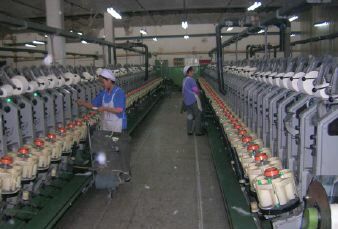 Here the washed cotton undergoes the first step in the process of spinning into thread. 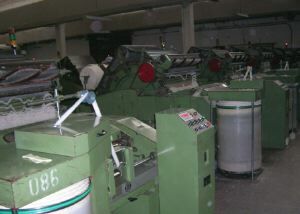 No 2 Cotton Mill is a large-scale operation with rooms filled with banks of processing equipment. An overseer watches the loading of semi-processed spindles for spinning into large reels. Old weaving machinery is still in use. And also there is very new equipment. Quality control in action. Loose threads are sown back into the cloth. 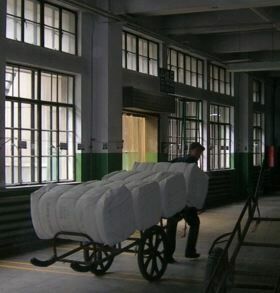 The finished product is taken to the store for delivery in China and around the world. 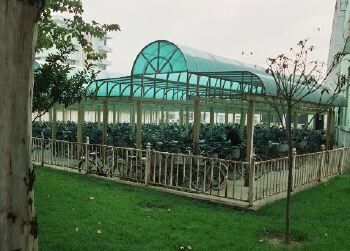 A bike shed for the employees of No. 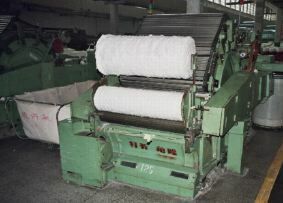 2 Cotton Mill. 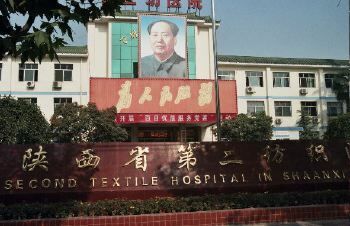 A hospital in Xianyang. Originally for the employees and families of No. 2 Cotton Mill, it has recently become a public hospital. 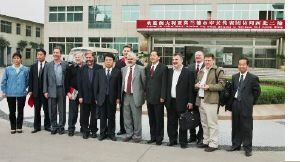 The Delegation visited the Art Department at Xianyang Normal University, at its very modern campus, to meet staff and student musicians and members of the Xianyang Musicians Association. A performance was given with traditional and modern instruments. 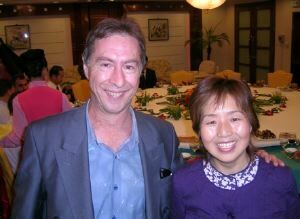 A month earlier, during the RMIT Public Art field trip to Xianyang, Moreland resident and artist Geoff Hogg had been made a Honorary Professor by Xianyang Normal University. 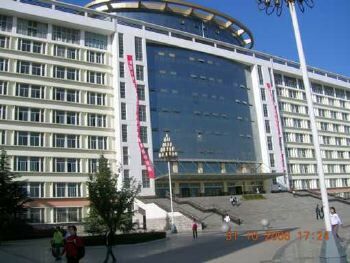 Building housing the Art Department at the Xianyang Normal University. 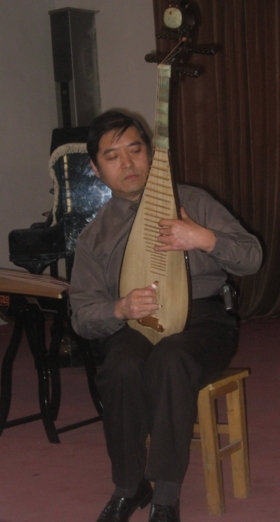 A member of the Xianyang Musicians Association plays a Chinese mandolin. 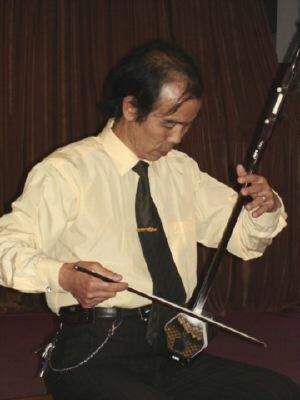 A member of the Xianyang Musicians Association plays a Chinese violin. A new Chinese antique market has been built in Xianyang and as part of the development a full size replica of a Qin fortress is under construction as a tourist attraction. 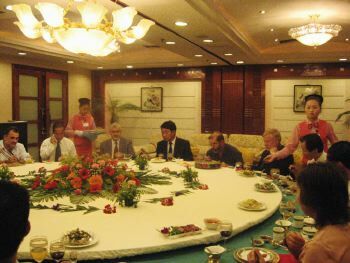 On the Tuesday evening, the Delegation was given a very sumptuous banquet by the Xianyang Party Secretary who we met two days later. Deputy Mayor Wang represented the Chinese side. 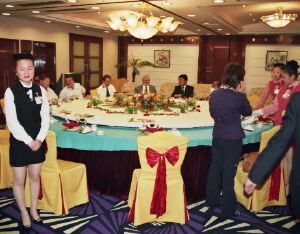 A very sumptuous banquet in preparation. Deputy Mayor Wang spent a lot of his time with the Delegation. This banquet was an opportunity to get to know him well. 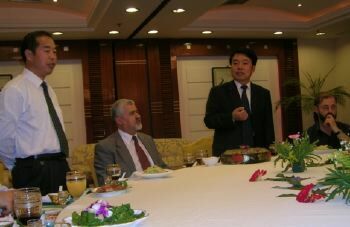 Deputy Mayor Wang giving a speech with Bai Yunfeng interpreting. 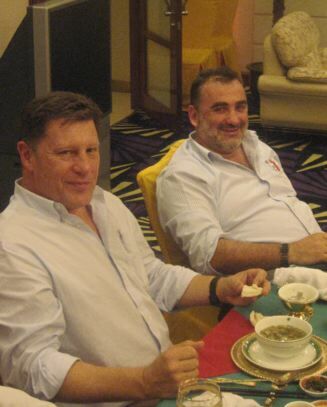 David and Adem relaxing at the banquet.